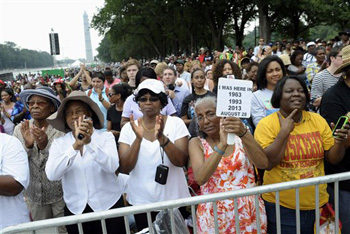 WASHINGTON (AP) - Americans from all cultural and racial backgrounds massed on the National Mall in Washington on Wednesday for a commeration of Dr. Martin Luther King's "I Have a Dream" speech. 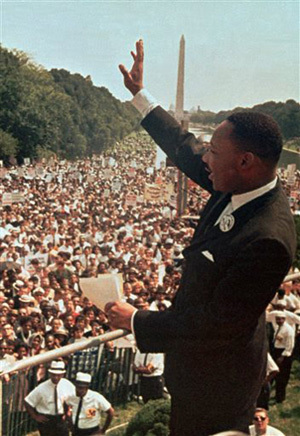 President Barack Obama and civil rights pioneers spoke on the same spot where, 50 years earlier, King's empassioned and unforgettable words gallvanized new generations to stuggle for racial equality. Two former presidents, Bill Clinton and Jimmy Carter, spoke movingly of King's legacy - and of problems still to overcome - as Obama listened. Turning serious, he added: "You only register progress by how far you have to go.... The fight has just begun and we can never accept the status quo until the word 'progress' is taken out of our vocabulary." Former President George H. W. Bush, in a statement, said Obama's presidency is a story that reflects "the promise of America" and "will help us honor the man who inspired millions to redeem that promise." A spokesman said the former president declined to attend because he was recovering from a recent heart procedure. Associated Press writers Darlene Superville, Brett Zongker and Andrew Miga contributed to this report.